Researches, due to sickness, the average employee takes nine leaves per year. Some of which may be endorsed to the unhygienic place of work. Viruses such as the flu, can stay on the grimy places like office tables, desks and electronic systems for 24 hours. Keyboards have around 7,500 bacteria which causes epidemic diseases dispersion. Office employees share telephones, staplers, personal computers and other office equipment. These equipment have enormous bacteria, needs to clean them appropriately. If your office is contaminated and polluted then you cannot work properly. Getting creative ideas in mind, it has to be cleaned environment around us. You are less probable to be unfocused by messy substances by working in clean environment. Unclean, unhygienic equipment of office has high prospects to feel your employee ill. Thus, the amount of sick leaves has been taking high. Clean environment protects the health of your employees, hence, increase the productivity of your business. Keeping your office untidy and having fresh environment, it will be required to hire cleaning services. Obtaining the right cleaning services in Dubai doesn’t have to be imposed when you have Mangrove. Mangrove is one of the best cleaning companies in Dubai. 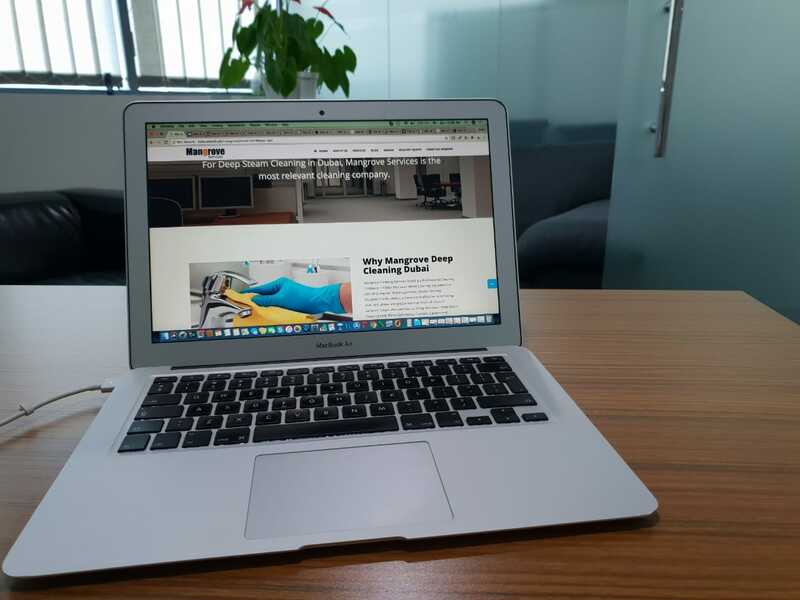 For office cleaning in Dubai, Mangrove has been connected with his customers for years, provide them clean and fresh professional places ensuring. You can impress your business partners and employees with shiny workplaces. Whether you have small business or large scale business, Mangrove services provides you organized, tidy workplaces. Mangrove steam cleaned you sofas, upholstery, office equipment, cupboards and cabinets etc. Mangrove is a deep cleaning company in Dubai because it’s an innovator of steam cleaning. Steam in contrast to chemical cleaning, is the best way to deeply clean all your office equipment. Because shampooing, rubbing or scrubbing leaves your office equipment out of class. Steam cleaning ensured the original quality of equipment after cleaning, also kills bugs, viruses and bacteria. Instead of giving job training, mangrove provides them training in a classroom environment. Mangrove educates them about the distinction of surfaces, fabrics and materials and how to handle them according to their condition. Employees of mangrove are well trained and professional, having ability to satisfy their customers by meeting their requirements. Mangrove does not compromise on the quality of material. It uses green cleaning services, protects their customers from health hazards. Micro Fiber cloth is used to ensure there are no scrapes and blemishes on the glass. Protect the delicate weaves of sofa, chairs and curtains, steam cleaning is employed.